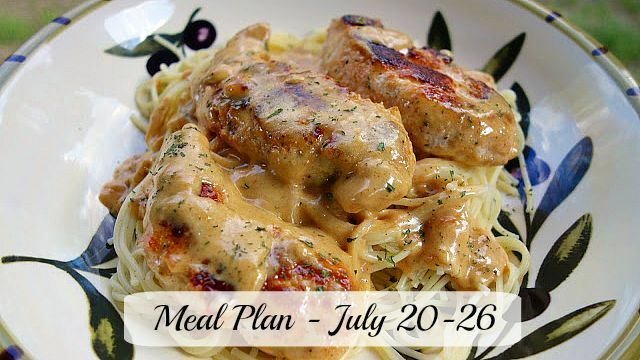 I just got back from a blogging conference and I have my meal plan ready. I actually wrote it on Wednesday while I was delayed at the airport. This way I’m ready to go with a shopping list and dinner plans for the week. Hope that give you some inspiration for dinner this week! The meals all sound delicious. I like chicken too, but I try to vary from day to day by inserting meals made of fish or meat substitute. You can make a nice spaghetti bolognaise with a minced soya product–can’t tell the difference. What it did was make me hungry. I haven’t heard of one of these – “chicken Lazone” so will have to look that one up. I’m fortunate my husband cooks because otherwise, our dinners would be called Lean Cuisine.